And although I would argue much of his writings were produced by one person and edited by committee, it is important to bitcoin that he not exist. His lack of existence, in a very real way, is what will help bitcoin survive this decade and morph into what it will soon become. Satoshi doesn’t matter. But that won’t stop us trying to unmask him or her. First, a recap of the hullabaloo. ￼According to a cache of documents provided to Gizmodo which were corroborated in interviews, Craig Steven Wright, an Australian businessman based in Sydney, and Dave Kleiman, an American computer forensics expert who died in 2013, were involved in the development of the digital currency. ￼ The signs point to Craig Steven Wright, a man who never even made it onto any Nakamoto hunters’ public list of candidates, yet fits the cryptocurrency creator’s profile in nearly every detail. And despite a massive trove of evidence, we still can’t say with absolute certainty that the mystery is solved. But two possibilities outweigh all others: Either Wright invented bitcoin, or he’s a brilliant hoaxer who very badly wants us to believe he did. The real value – the real fun – is in digging up all of the “facts” and putting them online. There is something in a good caper that makes a post pop, and it makes a tech reporter’s life fun for a while. In the endless river of content, a good “Hey, is this Satoshi?” post can make for a nice week. But Craig Wright is not Satoshi. While I don’t have the deep background that another prominent debunker, Cornell Professor Emin Gün Sirer has, everything in the story is wonky. Rather than go through the disproofs (most focus on potentially faked PGP keys), I would also argue that it doesn’t matter. We will trust one real person we don’t really know to make a great web server. We wouldn’t as readily trust one real person that we don’t really know to hold our wallets. “In short, the question of Satoshi’s real identity is flawed and serves only a prurient interest. Responsible journalism ought to serve the public good, not the click count,” wrote Sirer. I agree. Still not convinced this isn’t the Satoshi we’re looking for? Consider the sources. 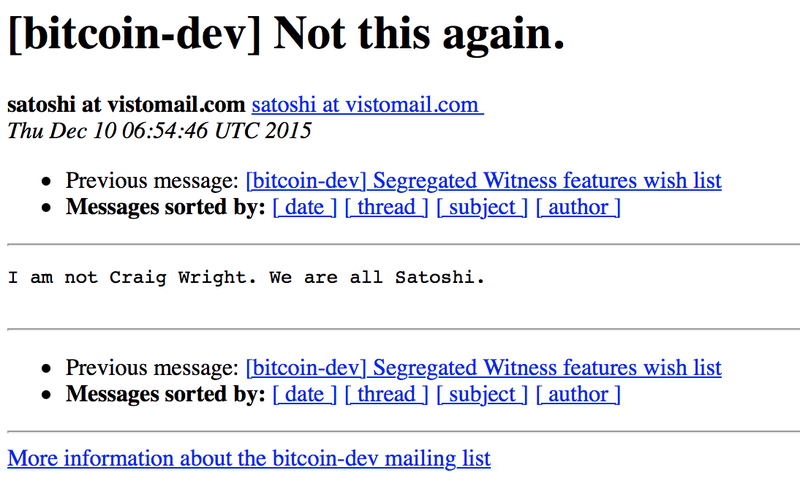 Both sites received “hacked” information detailing Wright’s involvement and said, outright, that he was Satoshi. Why did they get the emails? Because a disgruntled employee hated Wright and wanted the world to know he sucked. 1.Got a very curious email attempting to dox Craig Wright — Wired's Satoshi — back in Oct. Didn't find it convincing at the time. Why would someone “frame” Wright? Probably to encourage the world to hack him. A bitcoin user with $23 million in BTC is a huge target. It also puts Wright into a position of notoriety that is not particularly helpful. He will be at the center of a flame war in the bitcoin world that will pit him against hundreds of folks who came after Satoshi. The man or woman who is named Satoshi wears a heavy crown. Even if Wright were “involved in the development of the digital currency,” he is definitely not the only one to work on the project. Sirer thinks he knows who the single source of much of Satoshi’s writing is, and he’s not telling. But I also suspect there was a small group working together that decided not to tell the world who it is. At this point in computer history, the value of authorship has been subsumed by the importance of rapid change. While some of us may remember that Vint Cerf and Bob Kahn helped create the TCP/IP protocol and Sir Tim Berners Lee created the web, the wily instigators of Anonymous are, in a word, anonymous. Why? Because they are more effective and more frightening that way. I would argue that Satoshi receives the same benefit. What bitcoin needs to be is a product without an owner, a hunk of code that does something amazing and that anyone can use. When Linux appeared on the scene Linus Torvalds became the figurehead of a new way to write software. He is definitely not the first person to use the open source model, but the market needed a figurehead, an origin story, to create a cohesive narrative. That Linux narrative said “Yeah, this Linux stuff is free but it was made in the spirit of exploration and creation by a cool guy from Finland. So install it on a commodity PC to run your website instead of paying $10,000 for a bunch of Sun servers.” That sales pitch worked and today Linux runs the web. Bitcoin is solving a similar problem. In the same way Linux connected us to powerful servers that could sell us dog food, bitcoin is connecting us to powerful servers that bypass the nasty accretions associated with modern banking. Perhaps bitcoin, in its current incarnation, will fail. But if there were one central voice, one “person” running the show, I think the conversation would be much different. We will trust one real person we don’t really know to make a great web server. We wouldn’t as readily trust one real person that we don’t really know to hold our wallets. But if his or her product is well-vetted and he or she is a shadow, the story is far different. I understand the impetus to unmask him. But there is no need. In fact, what bitcoin needs to be is a product without an owner, a hunk of code that does something amazing and that anyone can use. It is Linux without Linus, TCP/IP without Cerf and Kahn. ￼What matters is Satoshi’s actual legacy. Our banking infrastructure is archaic, having been left fallow since the Y2K rewrite. There is very little transparency and auditability in the financial system. There had been precious little innovation in retail banking since 1959 until a few years ago. Even today, banks offer klunky, terrible interfaces to our money.I’m not going to claim that a virtual currency like Bitcoin is the ultimate solution, or even a contender for a credible solution at the moment. Bitcoin cannot scale to the globe, even with the recent planned improvements, and it has great difficulty on the security front. But there are some novel technical ideas in there that can enrich our global society; some discovered by Satoshi, others by people before him. Responsible media needs to drop the pointless Satoshi manhunt and focus on the technology and its implications. That’s where the real action is. It’s becoming clearer and clearer that every effort to identify Satoshi will be met with another, more compelling argument that he or she is someone else. It is a game of whack-a-mole that will confound journalists for the next few years until it stops. Perhaps one day there will be a final reckoning, but that will come long after it particularly matters. History books will have some trouble teasing out the real Satoshi, but I would note that the best book on Bitcoin, Nathaniel Popper’s Digital Gold, doesn’t actually try to name the culprit. Instead it focuses on the wacky characters who took the idea and ran with it. Some were successful, some flamed out, some got sick and could not continue. But the thread remains the same: bitcoin is a tool for everyone, everywhere. It does not belong to one person. If it did, bitcoin as we know it would morph into something that would buck its all-too-human creator. Even Satoshi said we are all Satoshi. In this rare case I think usually sloppy sentiment is beautifully true.